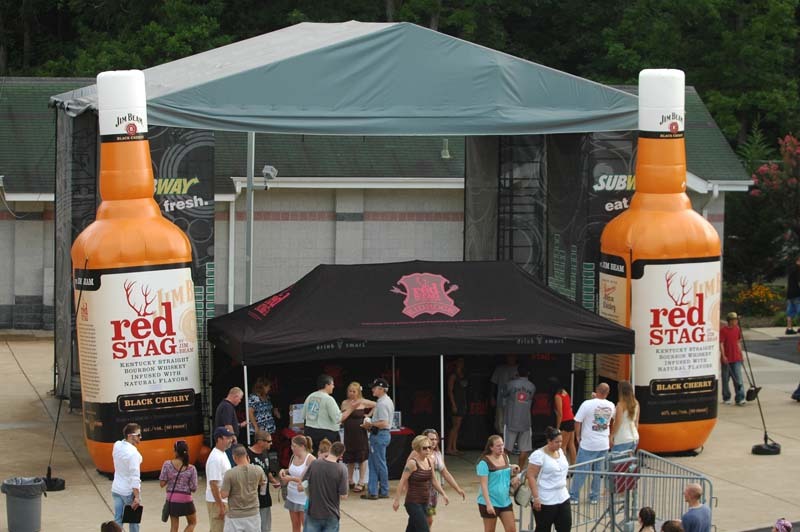 When Kid Rock hit the tour circuit with Lynyrd Skynyrd this summer, he brought along Red Stag by Jim Beam bourbon and plenty of promotional products to support it. The Detroit rocker inked a deal to be the face of the new cherry-infused bourbon during his 25-city “Rock ’N’ Rebels” tour. The partnership includes heavy brand integration, ranging from Rock weaving Jim Beam into the lyrics of his hit song All Summer Long to playing a Jim Beam/Red Stag branded guitar. The bourbon was hard to miss at the shows, thanks to 20-foot inflatable bottles, roaming Red Stag models and the opportunity to have a picture taken at the show with Kid Rock superimposed alongside the subject (compliments of Red Stag). Co-branded concert T-shirts were on hand, and when fans got home they could download remixes of Kid Rock songs at www.theredstag.com with the help of co-branded download cards. Logoed table tents and coasters were also peppered throughout the VIP areas. Even the tour buses were co-branded. It’s worth noting that Kid Rock himself also gave something away during the tour. For every ticket sold, he donated 50 cents to Operation Homefront, a nonprofit organization that provides assistance to U.S. military veterans returning home to their families.